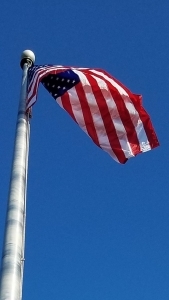 The Bryley Team Proudly Celebrates Veteran’s Day With A Flag Raising Ceremony - Bryley Systems Inc.
Monday, November 12, 2018. On a cool, crisp, Monday morning with clear blue skies , we proudly gathered outdoors by our 35’ flag pole and raised the American flag in a tribute to all veterans. We are very proud to honor our own John DeCola, Engineer and Senior Airman, USAF, and retired employee James Livingstone, Captain, USAF. Thank you for your service.